Michele Morgan was born Simone Roussel in Neuilly-sur-Seine, France, in 1920. 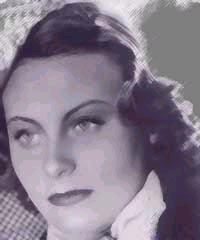 Having studied drama from the age of 15, she made her film debut in Mademoiselle Mozart in 1935. She was already an established actress when, at the age of 18, she appeared in Marcel Carne's legendary film, Le Quai des brumes, in which she starred opposite the acting legend, Jean Gabin. With the onset of war, Morgan moved to the United States where she took a contract with RKO. Unfortunately, her career in Hollywood proved largely fruitless and she returned to France in 1946. There she starred in Jean Delannoy's acclaimed 1946 film, La Symphonie Pastorale, a role for which Morgan received the Best Actress award at Cannes that year. During the 1940s and 1950s, Morgan became the most popular and sought-after actress in France, appearing in successful costume dramas and romances, such as Marie-Antoinette and Les Orgeuilleux. Her popularity waned in the 1960s with the emergence of the New Wave and the sixties fashion culture, although she was awarded the Legion d'honneur in 1968. In the 1970s, she made a successful transition from film to theatre. Now in retirement, Morgan is free to indulge in her other great passion, painting.